A cool fall or winter morning is the perfect kind of day for a breakfast of bacon and eggs or hot cakes...but, for those wanting a healthy, quick meal, a bowl of steaming oatmeal is more than comforting. Unfortunately, I have actually had oatmeal that was not at all comforting. Many years ago we took an unexpected trip to Staten Island because we had been told that my Italian grandfather was very ill. My father had to borrowed an older model station wagon from the company where he worked in order to haul our family of five, all of our luggage and our new, but large, six-month old apricot standard poodle, named Penuche. In bleak and snowy weather conditions, we started on our road trip from the Chicago suburbs to New York City. What we did not know was that the vehicle's gas gauge was faulty and we ran out of gas on the interstate in Pennsylvania. I can still picture my dad climbing over a wire fence and up the steep, slippery hillside to beg for gas at a farm while we all waited petrified and shivering in that old car. The farm people, while not exactly friendly, finally sold my dad a gallon or two of gas in an old can which they wanted back; of course my poor dad had to make a round trip up that hill and back again to return the can. Tired and cranky, we finally arrived at the grandparents' home only to find out that my grandfather was not ill at all. While good health is something to appreciate, my parents seemed quite tense. The next day, they decided to take us to the Statue of Liberty to at least make some sense out of this horrible trip. Unfortunately, I was not feeling well and it was decided that I should remain behind with my grandparents. They spoke little English and I only knew a handful of Italian words. I felt like I was an eleven year old who had been left alone in a foreign land. My grandmother made oatmeal and as she set a bowl in front of me, I didn't know what to say. There it sat...a plain bowl of mush...no milk and no sugar...just a thick glob of stuff. I did not want to hurt Grandmother's feelings but, I did not know what to do...so, I just sat there and picked at it until she mercifully removed the bowl from the table. We left for home the next day. Back at school, my classmates would not believe me when I told them we had driven all the way to New York and back again in such a short time, so I did not even get the satisfaction of telling about that trip. Parts of the adventure are long forgotten, but I will always remember that oatmeal. While a flavored package of instant oatmeal could have saved that long-ago breakfast, I actually prefer to measure out and cook my oatmeal...in the microwave. It is quick and very inexpensive. 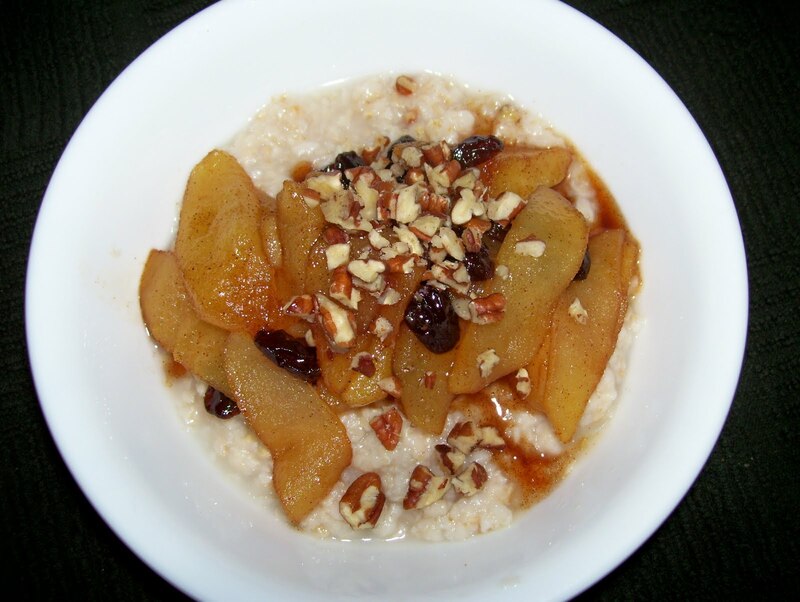 With the addition of today's sautéed apples, plain oatmeal can become gourmet. Note: The apples can also be served as side dish or as a topping for pancakes or ice cream. Golden delicious apples cook down well and are not mushy. You will love this inexpensive and easy recipe. Core and peel apple. Slice into ¼ inch sections. Heat margarine or butter in a small saucepan over med heat. Add apple slices and stir. Turn heat down to low, cover pot and cook apples stirring occasionally. When apples are almost tender, add sugar and cinnamon to taste. Stir and replace lid and simmer mixture until the apples are tender. Remove the lid and continue cooking gently until some of the liquid evaporates and the apple mixture is the desired consistency. Remove from heat, add raisins and combine gently. Serve. Place 1/4-1/3 cup oatmeal in a small dish. Add water to cover oatmeal, stir. Cook in microwave on HIGH for 1 minute. Remove bowl and stir. Add more water if necessary and stir. Spoon hot apple mixture onto cooked oatmeal and sprinkle with chopped pecans. Serves 1.